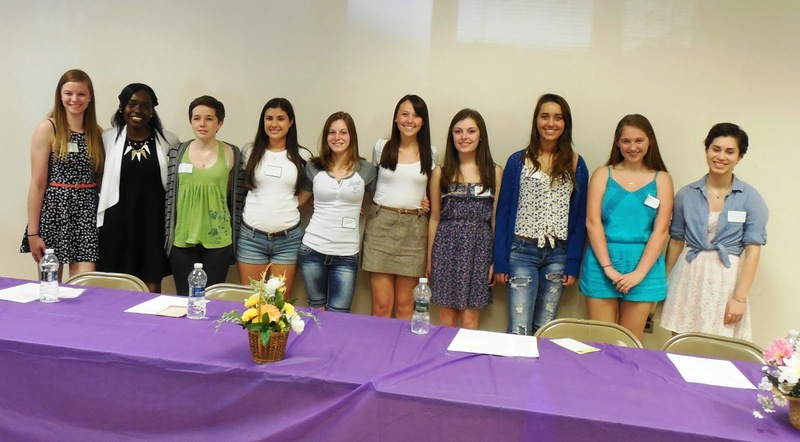 of GFWC (NJSFWC) for girls who will complete their junior year in high school. GCI was first started in 1947 and is held at Douglass College, now Douglas Residential College Campus of Rutgers University and attendance reaches about 200. New Jersey was the first state to develop this type of training program for girls and the Delegates are sponsored and the cost underwritten by local NJSFWC clubs. NJSFWC Clubwomen act as housemothers and supervise the girls while they are on campus. dormitory, eating at the cafeteria, attending lectures and workshops. They will learn about career choices from a variety of professionals, such as Captain Donna Hernandez, a former Police Captain, who will speak on police work and dating dangers. Pictured are girls who attended a Girls Career Institute (GCI) Orientation, held by the Highlands District at the Roxbury senior center. From right: Julia Arredondo & Brooke Winters, both from Long Valley, Briana D’Angelo, Vernon, Sabrina Gattuso, Hardwick, Molly Nadeau, Rockaway, Hannah Pyrzoski, Mine Hill, Grace Conti, Chatham, Megan Broady, Long Valley, Karol Pierre, Vauxhall, Caitlin Wrege, Belvidere. 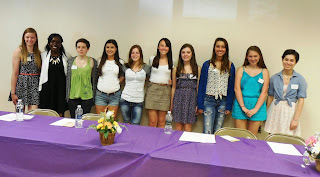 All 8 NJSFWC Districts hold an Orientation for the girls, with the event being held this year from June 9-12th. Using the pinwheel as a symbol for child abuse and neglect prevention, GFWC Partner Prevent Child Abuse America focuses on prioritizing healthy child development and eradicating child abuse and neglect. For two decades, market research consistently has shown that the public views child abuse and neglect as a serious problem. As a national organization whose mission is "to prevent the abuse and neglect of our nation's children," our emphasis is to now transform that awareness into action. We now have that opportunity through the pinwheel, which reminds us of childlike notions and stands for the chance at the healthy, happy and full lives all children deserve. 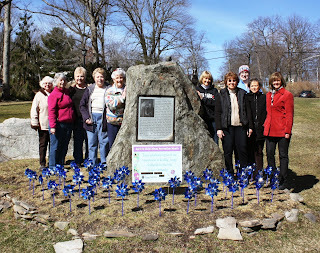 Pinwheels for Prevention began as a grassroots campaign among our chapters in Georgia, Florida and Ohio. Their success and our desire to create a national symbol for child abuse and neglect prevention led us to take this effort nationwide in 2008. See how two clubs displayed their Pinwheels for Prevention! What activities has your club participated in this week? Email the webmaster your photo's at webmaster@njsfwc.org. In celebration of its twenty-first anniversary in 1889, the Sorosis Club of New York City (founded by “Jennie June” Croly) proposed a conference of women’s clubs to pursue the cause of federation. That conference was held in New York City on March 20, 1889, with the goal of preparing a constitution for ratification the following year; sixty-one clubs attended. Clubs that had already applied for membership in the new General Federation of Women’s Clubs were invited to the ratification convention, which was held at the Scottish Rite Hall in New York City, April 23-25, 1890; sixty-three delegates from seventeen states attended. After some discussion and amendments, the constitution was ratified on April 24, 1890, and the General Federation of Women’s Clubs was born. On April 24, 1940, the actual birthday of the General Federation of Women’s Clubs, a national broadcast was made in the studio of the National Broadcasting Company in Radio City, New York. The president of Sorosis, Mrs. Eugene Willis Denton, spoke for the Sorosis Club of New York, which celebrated its twenty-first birthday in 1889 by starting the organization of the General Federation. The celebration of April 24 as Federation Day was added to the GFWC standing rules in 1976. The Highlands Spring Conference & Achievement Day was just one of the many District Spring Conferences held for the NJSFWC clubs this spring. Over 120 Clubwomen from the Highlands District attended the conference and 119 entries were submitted in the Arts/Creative Department. Entries included, baked goods, crocheted & knitted items, paintings and photographs. Jill Passaretti, NJSFWC President-Elect spoke on the topic, "Step Outside Your Comfort Zone'. She encouraged Clubwomen to take new chances and experiences and even become more involved in your club, by volunteering for a new project or activity. Say 'yes' to a new position or attend a new event. Check out these bird feeders! Special State Project Fundraiser A Success! The Special State Project fundraiser,in support of Family Promise was a great success! Over 250 Clubwomen attended and had over 110 Tricky Tray items and a variety of silent auction items to choose from. Clubs were extremely generous and there was a huge variety of gift baskets. The event was held at the Upper Montclair Woman's Club house and a delicious lunch was served. Jane Cunningham Croly (1829-1901) was a pioneering journalist who, under the pen name Jennie June, contributed articles to newspapers such as The New York Tribune and The New York Sunday Times. She was one of the first women to write a syndicated column and the first to teach a college journalism course. She founded the Sorosis club for women in 1868 and the Women's Press Club of New York City in 1889. She later organized the General Federation of Women's Clubs. Julia Ward Howe (1819-1910) is best known for authoring the poem "The Battle Hymn of the Republic". She was a prolific writer and became the first woman inducted to the American Academy of Arts and Letters. She was a leader in the suffrage movement and a respected lecturer for numerous causes. She helped organize the New England Woman's Club in 1868 and served as the President of the Massachusetts Federation of Women's Club. Ellen Curtis Demorest (1824-1898), helped revolutionize the fashion industry in the 1860s with the invention and mass-production of her paper dress-making patterns. She owned a successful dressmaking shop in New York City and a popular magazine which featured Jennie June as one of the chief writers. She was also a founding member of Sorosis and served as both vice-president and treasurer for the club. Frances Willard (1839-1898) was an active leader in the temperance movement of the late 1800s, and served as president of the Women's Christian Temperance Union for twenty years. A noted orator, Willard won a large following by traveling the country with her message of temperance and later, suffrage. She was also a member of the Chicago Woman's Club and spoke at the Chicago Biennial Convention in 1892. Jane Addams (1860-1935) founded Hull House, a settlement house in Chicago, which served as a model for the social reform movement of the Progressive Era. She was a vocal advocate for working women and child labor laws. She was also a leader in the suffrage movement and helped to establish the International League for Peace and Freedom. She was awarded the Nobel Peace Prize in 1931. Addams was an active member of the Chicago Women's Club and served as Chairman of the GFWC Committee on Child Labor in the early 1900's. Julia Lathrop (1858-1932) was the first person appointed to head the federal Children's Bureau which was created in 1912. President Taft chose Lathrop because of her impressive accomplishments in social work. She was also a member of the Chicago Woman's Club and assisted the club in their work for juvenile court laws. Bertha Ethel Knight Landes (1868-1943) was president of the Woman’s Century Club from 1918-1920, and a member of the Women's University Club of Seattle, president of the Washington State League of Women Voters, and president of the Seattle City Federation of Women’s Clubs. Landes was later elected to the Seattle City Council in 1922, and two years later, she was elected Council President. In 1926, after many accomplishments on the Seattle City Council, Landes was elected mayor of Seattle, becoming the first woman to be elected mayor of a major city. Girls Career Institute (GCI) formally known as Girls Citizenship Institute was first started in 1947 and held at Montclair State Teachers college with 100 school girls attending. Since 1948, GCI has been held at Douglass College, now Douglas Residential College Campus of Rutgers University. New Jersey was the first state to develop this type of training program for girls and the chairman was invited to speak on the project at the General Federation convention in 1949. Delegates, who have just completed their junior year of high school are sponsored by individual clubs. THe event, held in June had attendance of over 400 in 1968. The cost was $5.25 per girl for the first session, $35.00 in 1964 and is now $200 for the 4 day program. Clubwomen serve as 'house mothers' during the week and well known speakers from many fields are invited to speak throughout the days. Entertainment is provided and the girls get to 'live' in the dorms during their stay. Applications have been distributed to all the NJSFWC clubs and the forms are due to the Chairman by April 10th. Please visit the NJSFWC website for additional information. Nearly 150 women met on Friday, November 16, 1894 in Union Hall, Orange, New Jersey in response to an invitation issued by the Woman's Club of Orange. The 65 delegates and others represented 36 clubs and had traveled from as far south as Bridgeton, Haddonfield & Merchantville. Think of how difficult a journey this would have been for women in 1894. Many traveled by trolley, train and carriage and had to leave before day break to arrive by 10am. One of the speakers, Florence Howe Hall advocated the formation of a state society or federation as a means of bringing women together for an interchange of ideas and methods and for the cultivation of good fellowship. Before the meeting adjourned that day, a constitution and bylaws were written and adopted and officers were elected. THe New Jersey State Federation of Women's Clubs was established! Mrs. Charles B. Yardley of Orange was elected as the first President and the official charter number of clubs was listed as 36. In the spring of 1895 the Lily of the Valley was voted on as the Federation flower and buff & blue were favored for Federation colors and the theme at the first Annual Meeting held in Newark on October 24-25, 1895. 175 women attended the annual meeting and 13 chairman reported on various committees that had been established. Annual meetings continued to be held in the fall until 1966, when the month was changed to May, which still stands today. Since 1947, almost all conventions have been held in Atlantic City. In 1902 there were 100 clubs. Stay tuned for more Federation information!